Jeff Ward is the Energizer Bunny of racing. The guy just keeps going, and going and going.… With no regard to aging, or competitors that could be 40 years younger than him, Ward recently announced that he was going racing in the American Flat Track National Championship. Ward will race the TT events on the schedule in the Singles (450) class. He is spending the winter preparing and writing another chapter in a career that is arguably one of the longest and most diverse in professional motorsports racing. Ward is perhaps best known as one of the most decorated motocross racers of all time, and has earned seven AMA National Championships in motocross and supercross, as well as seven Motocross des Nations victories, and countless other accomplishments, including X Games Gold medals, Supermoto National Championships, finishing second at the Indy 500—the list is seemingly never ending. Racer X: You posted recently on Social Media a photo of yourself outside Malcolm Smith’s dealership and basically said you are making a comeback to pro racing with flat track and AFT. Well, last year I started riding a little flat track here locally in Southern California. I had a friend, Beau, he used to own a team and had Brian Smith as his rider. And it seemed like fun what they were doing. So I just started riding some flat track out at Jeff Blackmore’s ranch—which is out in the Murrieta area. And man, I just kind of had fun. I think everyone thinks of me as a motocross guy, which is true, but before that, I used to have a steel shoe and raced Flat Track and TT as a kid. Then last summer, I did a supermoto race up in Sturgis, and I’ve just been riding a little more than usual. So, I figured it would be cool to add this to the list of things that I’ve done. You are 57 years old! And now riding KTM’s? Yeah, well, so for me, its kind of back where it started. Flat Track is certainly something I know how to do. The KTM thing just kind of worked out, and Kawi has really not much support in this sport. It just kind of worked out that way—much like supermoto did when I rode Honda. I did eight years of supermoto with Honda and won everything on those bikes, but its been a long time since I raced on two wheels. I also did ten years or so of Indy car as well as my motocross career. Its funny, now the motocross thing was kind of the smallest part of my career now! The cars, well, I’ve been doing it since I retired. And supermoto was almost as long as my motocross career. I’ve had a lot of racing stuff going on and this just seemed like something that would be cool to do. Flat track is having a resurgence in the USA, and I feel that it makes a good story. It would be kind of cool to bring some more exposure to it, kind of like supermoto did when it first started. It had a lot of big names come in and started to grow, but unfortunately kind of disappeared when the industry had a slowdown. But flat track’s not going anywhere. It’s been around since day one. So that’s kind of where I’m at right now. I just pieced it together. 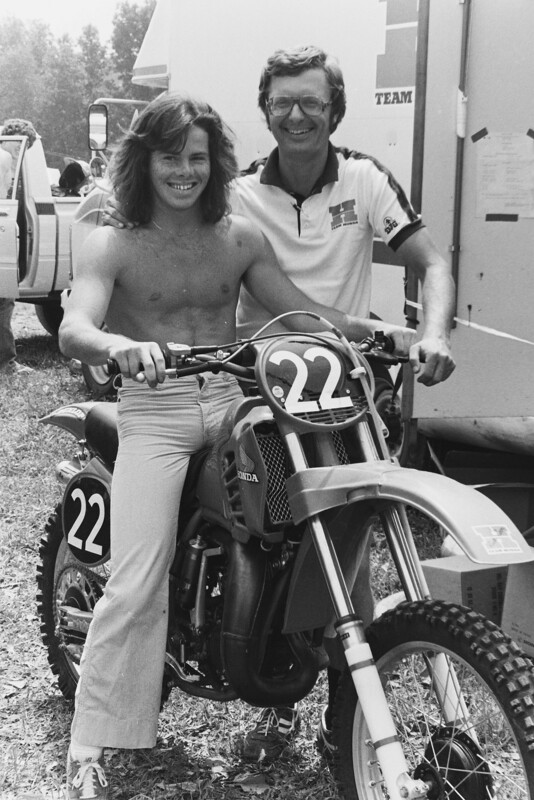 I’m working with Johnny Lewis who has been racing flat track for a long time. He uses KTM’s, and I’ve done his schools and have been helping him out. So we kind of have a collaboration where he’s going to have some bikes that I can run, and not have to bring mine to the races, and I can just fly in. We are going to see if we can piece some sponsorships together. It’s going pretty good! So what classes are you planning to race? I know that AFT is the AMA American National championship, but don’t they have several classes? Yes, it is the AFT professional AMA series. They have two classes, Twins and Singles, but the big twins that they race, I am not sure I am ready for those! I’ll race singles on the 450. I’m just going to be doing five or six races, mostly all the TT stuff—Daytona, Phoenix, I think Springfield, Sturgis, and then Peoria. I wanted to do Peoria quite a few years ago when I was doing supermoto just because I was kind of in that realm of slicks on dirt and just seemed like it would be something really fun to do. But just never happened. So now I get a chance to do it. It’s ten years later or more. I’m not a spring chicken, but I’m in better shape than I was when I raced supermoto—and I haven’t forgot how to ride a bike. I’ll just see how it goes. If things go well, then I might do a couple of short tracks as well, maybe have some fun and see where that goes. But mainly I will focus on the smaller TT short track stuff. Just to be clear for everyone—can you confirm how old are you now? I’m 57. I’ll be 58 in June. So that’s senior citizen territory! I think you might be, quite frankly, the oldest professional motorcycle racer in the country. That’s a trivia question I’ll have to see if I can get to the bottom of. Yeah, I don’t know. I don’t know too many guys racing pro anything at 57. There might be a hillclimber or something strange like that, but nothing that I know of. We will have to dig into the Racer X archives and see what we can find! I’m still the oldest to win an X Games gold medal at 48, I think I was. So that’s pretty old. If I went out and won a TT, that would be pretty cool and probably hard to beat maybe. What are your goals and expectations for your results? Everything I do, I go to do my best, which is try to win. So that’s my goal here. I still feel I have the talent. I’ve ridden with guys that have won those races and I feel confident enough that I can win on the TT. Now, doing a mile race would be another story. That’s something I’ve never done, and one thing I’ve never gotten into after motocross. For me, I’m pretty good with the motorcycle figuring out what it takes to figure out whatever it is. Like with supermoto with slicks on dirt, and then slicks on pavement with dirt on the tires. You kind of learn by your mistakes. But on the mile, you don’t get much room for error to make a mistake and brush yourself off and get back up and go again. But the TT stuff is kind of up my alley with the turns and little jumps. So I don’t feel so bad. I feel I could win if the circumstances all go well. It’s just wait and see right now. TT is certainly more point and shoot, it has left and right turns and a jump, more similar to motocross. I’m glad to hear you are planning to leave nothing on the table! Congratulations on that. What else has been going on in your life? Everything’s good. My daughter is going to college in Ohio for a soccer scholarship, her second year there. My son’s in the Army and he has just left for Iraq again. I think that’s for only four or five months this time, to Baghdad. It’s his third deployment. He was in Afghanistan two other times for eight months. My other boys are doing well. One works for Orange County Sheriff’s Department, and my other one has a business he’s working. So family is good, and my wife is awesome. I have just been keeping busy training on mountain bikes. Like I said, I’m in better shape than I was when I did supermoto. I’m like 20-something pounds lighter now. I have been going to the gym as well—so for sure I’ve been taking it serious. You know, everything, when compared to motocross, and for what I’ve done after that has always been easy. So that’s what I’ve always had my reference—motocross. From car racing when it’s hot and other guys are complaining, and I’m like, “Dude, we raced motocross in hotter weather than this.” So everything has always been gauged off of how hard motocross was to race and win, from supermoto to cars to everything. How about cycling? That RAAM race (Race Across America) you did with David Bailey, Doug Henry, and Micky Dymond was pretty wild! Well, yeah, motocross made everything seem easy besides cycling! Cycling’s been something that’s been really challenging. I did the RAAM like you talked about with David, Doug, and Micky. I did a twelve-hour time traveler with that. That really punished my body. I did 217 miles in twelve hours in 95-degree heat. So that type of stuff makes you dig down and really struggle with nutrition, fuel, and dehydration. It reminded me of the motocross days, where the other stuff you really had to dig deep to push through. But in normal life, you never have to dig like that. So I have that kind of built into me, and that makes everything a little bit easier. That’s impressive, and I think you are very right about that. After you do motocross, everything else is kind of easy. In other sports, when things get hard, some guys bail out early. They complain about the heat. I’m like, try this with a broken ankle! I’ve done motocross for three or four races with a broken ankle in the heat and outdoors. 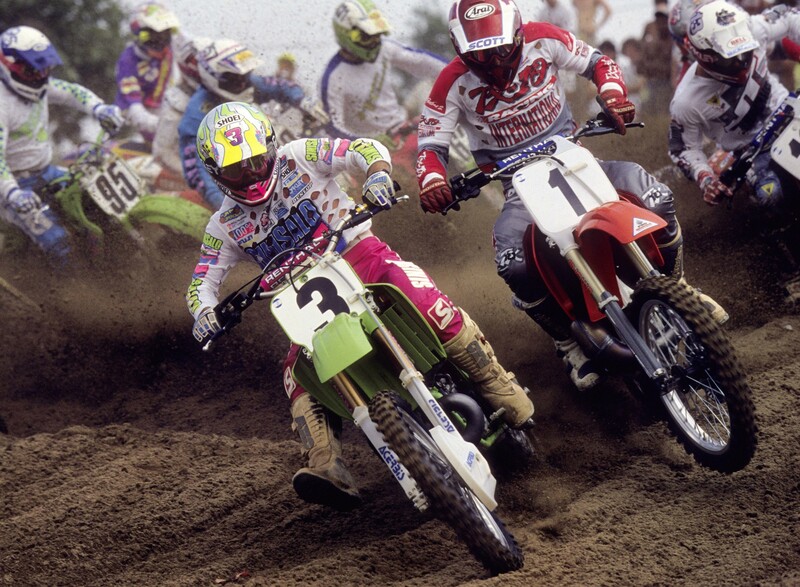 There’s just so many things in motocross that when you move on—and you watch other sports too. Somebody goes down in basketball and it’s like they broke their ankle, but they act like they need to medivac them out or something. But in fairness to them, those guys don’t see injuries anywhere near as much. Those guys don’t see that type of stuff to where motocross you see it every weekend at the local race. You see guys with their foot turned around the other way. It becomes normal to a motocrosser to where we go down and get back on the bike and finish many races with something broken and you don’t find out until the next day. But it seems like in some other sports they’re not used to seeing it. Who is helping your program this summer? Troy Lee is helping out a lot. Also, I have a company called MedTerra. That’s a CBD company. Also the guy I said before that owns the Blackmore Ranch. I ride with those guys and they help me with the bikes. Malcolm Smith and his dealership is helping out, as well as the gym called The W. That’s Johnny Louch’s place. I train down there and they work with MedTerra. We’re doing a new gym down here in the Orange County area that is going to be opening pretty soon. But they have been a big help. Then Monster Energy of course—Monster is a big sponsor of mine. So pretty much those ones right now, but I’m going to find some little ones that are coming on. Once I get everything all pieced together, we will be putting out a little press release with everybody that’s on board and who’s supporting the cause here.